Introducing the pT2-500 microphone preamp and instrument direct-in. The pT2-500 is an API™ 500 series compatible module that incorporates our new-technology Type 2 circuit design. Our Type 2 design provides the traditional ultra-resolution musicality of our original design preamps, but adds serious analog depth and warmth. In short: It sounds BIG! The new DI circuit calms piezo transducers and provides a THRU jack for easier re-amping and multi-effects. 70dB of gain, high-headroom, low-noise, amazing sonics. 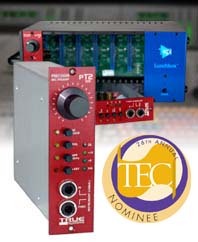 If you haven’t heard TRUE preamps before, you might want to start here! THD+N (+26dBu, GAIN = 40dB): 0.0004% typ. Specifications are subject to modification without notice.